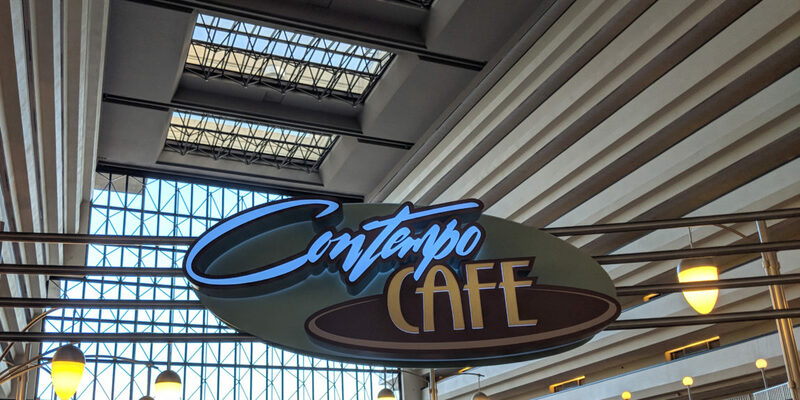 The Contempo Café is a quick service restaurant located in the heart of the Contemporary Resort. Not only do you get to watch Monorails pass while you eat, there is a beautiful Mary Blair mosaic, and delicious food. One of the great things about Contempo Café is it’s location. The Contemporary Resort is the first stop on the Resort Monorail Loop and there is a walking path from the Magic Kingdom to the Contemporary. Enjoy an afternoon break away from the crowds while still being within walking distance of the Magic Kingdom. Contempo Café is open from 6am to Midnight. Breakfast, Lunch and Dinner are available. Baked goods, grab and go options, as well as spirits and soda and also available. Breakfast includes classic Disney offerings such as Mickey Waffles, Pancakes, and Bounty platters (which is a little of everything.) Lighter options like steel cut oatmeal or an egg sandwich are also available. Lunch has some really delicious sandwich and burger options. Lunch portioned Caesar salads, flatbreads and rice bowls are also up for grabs. 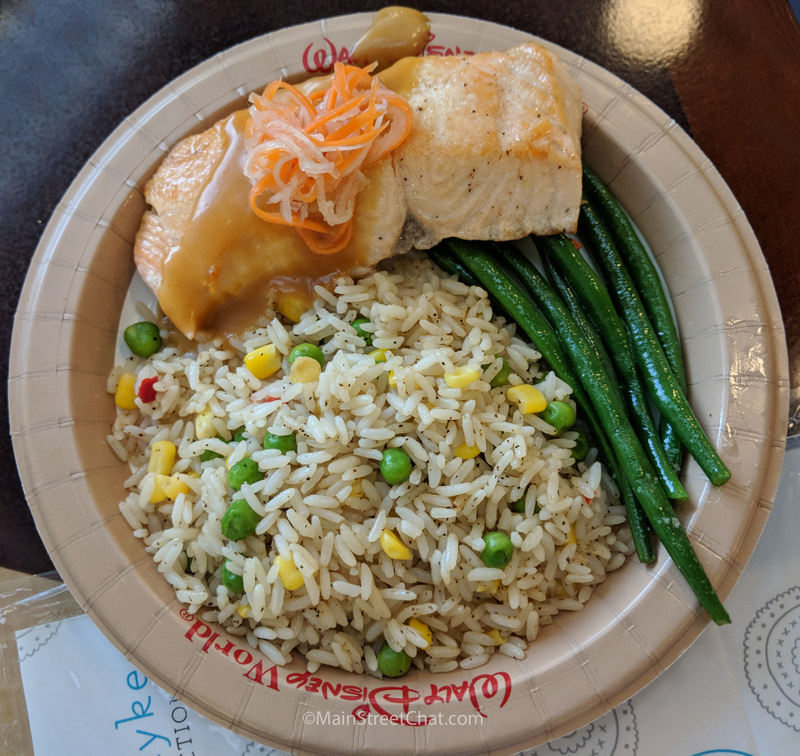 Options is the name of the game here which is why we really love Contempo Café. Dinner is very similar to the Lunch menu. In addition to sandwiches, flatbread pizza, and salads they have a slow roasted beef, salmon plate and seared chicken available. The menu is extensive at Contempo Cafe. We could easily eat here once a day over the course of a week long vacation and never repeat a meal. The only real drawback is that they are not opened 24 hours. We loved the food so much we ate here twice while on vacation. Adolfo got the Smokehouse Burger and the “Chicago style” Italian Beef Sub. They were both super delicious. To be Honest I (Elyse) was a little jealous that I hadn’t ordered the Italian Beef Sub for myself. French Dips are a favorite of ours but I (Elyse) was a little hesitant about ordering it from a quick service location. I learned my lesson. It was sooooo good. The bread was nice and crusty. The portion of beef was super generous and tender. The au jus was great. It’s easy to ruin a good sandwich if it’s too salty but this was spot on. The Smokehouse Burger was also pretty good. It was the typical patty served inside the park but they dressed it up a bit more. It made a huge difference in the quality of the sandwich. Neither one of us are huge fans of Disney Burgers but Adolfo said that he would most definitely be ordering this again. The burger is served with a bacon marmalade, onion ring, cheddar cheese and is on a brioche bun. Much fancier than what you would typically get inside the parks. I got the Grilled Salmon and the Hot Turkey Sandwich. By far the winner was the Hot Turkey Sandwich. Served on a high quality multigrain bread with a cranberry aioli. It also had arugula and bacon. Need I say more? It was delicious and the portion sizes were huge. I could only finish half of the sandwich. Adolfo happily finished off the rest of it. It was one of the best meals we had the whole vacation. The Griddled Salmon was very good for a healthier option. You get a pretty big portion of salmon. The Salmon was extremely well done and it wasn’t of the highest quality. The Teriyaki sauce was very tasty and Kaitlyn seemed to really enjoy it. In fact she ate more of this than I did. Sides included rice and seasonal vegetables. While this meal wasn’t mind blowing I would definitely get it again if I wanted a lighter and healthier option. The one thing we truly appreciate about Contempo Café is how great all the cast members are. Kaitlyn was being a little feisty one night and decided to dump half of her food on the floor. I was super embarrassed and asked for a vacuum. (We will clean up after our child if we consider the mess excessive). The cast members laughed at me a bit ensuring me that they had it covered and then we spent a while talking about their favorite kids tossing food stories. Another time we spent quite a bit of time discussing how one of the cast members thought Animal Kingdom had lost some of it’s magic since Pandora opened. She was very genuine when she said that she thought it no longer offered enough for a family with young children. Often times cast members are huge Disney fans and will gladly discuss what they like or dislike about what’s going on in the parks. They are also a great source of information and might have some tips from time to time. This was a great place to eat. It’s in the heart of the Contemporary and we will be returning many times in the future. The only negative thing we can say is that one time our french fries came out heavily salted. Really, that’s not worth complaining about. 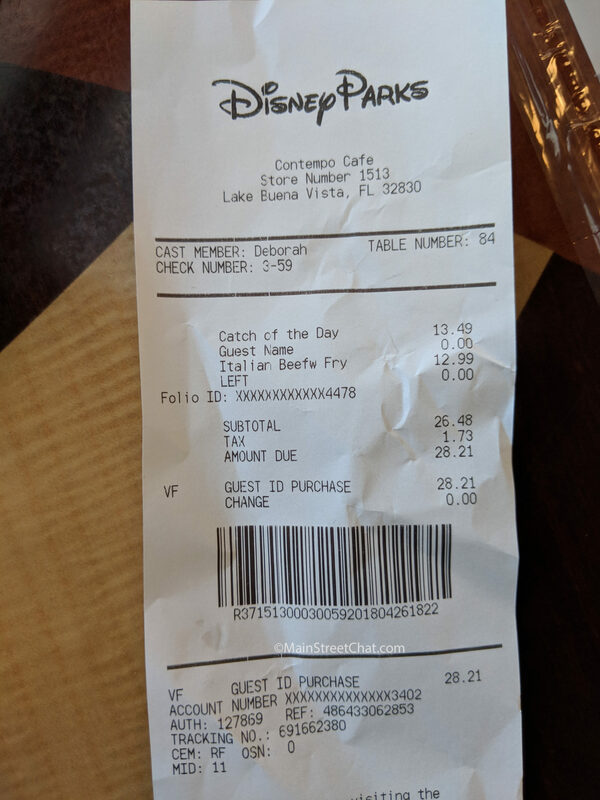 Is Contempo Café worth leaving the parks for? ABSOLUTELY!!!! This is really a great location. You can take the monorail over from the Magic Kingdom, and have a leisurely lunch during the hottest time of the day. Then walk back over to the Magic Kingdom when your done. 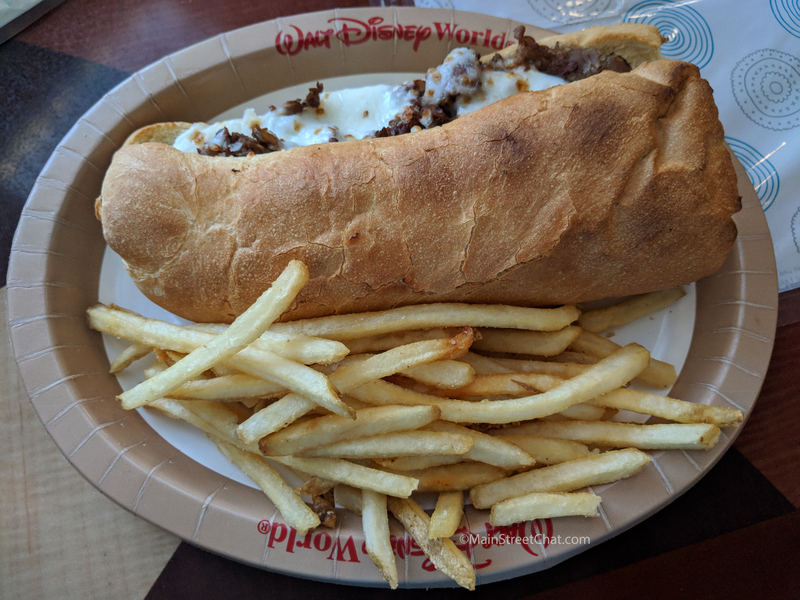 The food here is great and better than some of the quick service locations in the park.